I've been posting ads in alphabetical order by publisher but I see I messed up last week. Micro Sports should be ahead of Microillusions which I believe I originally had as two words and didn't realize when I switched it to one that my order got changed. I'll often have 4-5 of these posts written in advance and wasn't paying close enough attention. Today's two companies do fit together nicely in one post though so it's not too bad of a mix up. Despite the similar names of this week's companies and the fact both focused on sports management titles, the two were initially not related. Micro Sports was based in Chattanooga, Tennessee and released its first game in 1991. It only released a handful of games, most of which were about managing college and professional football teams, before being acquired by MicroLeague in 1996. Based in Delaware, MicroLeague was originally known as Micro League Sports Association (the space in Micro League is intentional) when it released its first game, MicroLeague Baseball, in 1984 for most home computers. The game is about managing baseball teams and it does feature the Major League Baseball license so all of the official teams and players are included which helped it stand out. MicroLeague followed it up with a few sequels and also developed management games about wrestling and football. 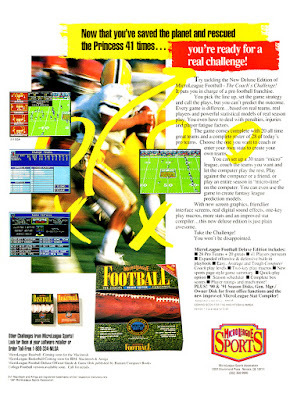 I'm a little unclear of the exact company history; a MicroLeague Multimedia was founded in 1989 and it would seem that was likely created to help the developer expand beyond sports software. MicroLeague Multimedia published software, books, and other media under the brands MicroLeague Interactive Software, AbleSoft, KidSoft, General Admission, Rabbit Ears, and APBA. In December 1997 MicroLeague Multimedia filed for bankruptcy and although the aforementioned AbleSoft survived, that was the end of the MicroLeague name.